ALL TEST INSTRUMENTS ARE MANUFACTURED TO THE VERY HIGHEST QUALITY ALLOWING QUALIFICATION TO COUNCIL DIRECTIVES 89/336/EEC. ALL ITEMS ARE CE APPROVED. Standard WRIST STRAP TESTER has a single test range 0.75 meg-ohm to 35 meg-ohm. (Other resistance ranges available on request). The instrument has a green light for pass (i.e. resistance between 0.75 meg-ohm and 35 meg-ohm) and 2 red lights which indicate either High resistance fail or Low resistance fail. A buzzer sounds in any fail situation. Very easy to use. (Custom backboards and other instrument colours available on request). 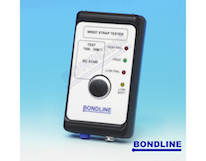 WST1 Portable instrument for checking the continuity of fitted wrist-strap and cord. Unit has banana socket and 10mm stud. (Requires 9 volt battery). FP Foot plate and cord. WSTBP Wall mounted back plate and cord. All testers will illuminate green if the outlets wiring is correct and the path to earth ground via the equipment grounding conductor is intact. The tester will alarm and illuminate red if either condition is not met. Wall mounted unit for checking the continuity of fitted wrist-strap and cord. (Requires 9 volt battery). 6 inch (150mm) cord (0 meg-ohm). WST2 Wrist strap test station. Wall mounted unit for checking the continuity of fitted wrist-straps and cords, fitted shoes, heel straps or toe grounders. (Requires a 9 volt battery). 6 inch(150mm) cord (0 meg-ohm). 6 ft( 1.8m) cord (0 meg-ohm). WST3 Footwear/wrist strap test station. For accurately measuring surface resistivity and point to point resistances, this kit includes 10v / 100 volt meter which is accurate to within half a decade. Complete with 2.5kg weights (black) and all connecting leads and conductive carrying case. SRM100K Resistivity kit. (Includes carrying case). 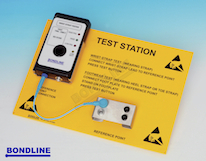 This Professional auditors kit can be used for measuring Surface Resistivity, Point to Point Resistance, Point to Ground Resistance and Bonding Points to ground. Highly accurate digital field meter with optical distance indicator which ensures accuracy and repeatability. The HOLD button allows readings to be held, if necessary, in hard-to-read locations. It has an easy to use zero button for greater accuracy. Requires a 9 volt battery. SL3 Digital static locator. (Includes carrying pouch). 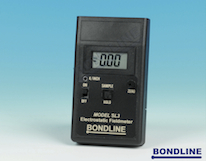 This handheld, portable, digital electrostatic field meter, detects and measures electrostatic fields. Includes carrying pouch and ground cord. Test range 0 – 160kV. 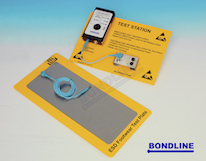 The ESD Floor Test Kit has been developed to offer a quick simple test procedure for testing the electrical characteristics of flooring. The kit is supplied with a conductive carrying case. This unique hand held instrument can be used to check that the ESD floor is actually grounding the operator. It also checks the heel straps and ESD footwear is working in conjuction with the ESD flooring. KSFC1 Test Kit( includes carrying case). Electrostatic field meter and charge plate set for measuring ionizer efficiency. This kit is supplied with high voltage generator and the field meter has built in timer for measuring voltage decay times. Supplied complete with carrying case. CPM7100 Charge plate monitor kit. Includes carrying case.